I made a dress to match my Luxulite acorn necklace. 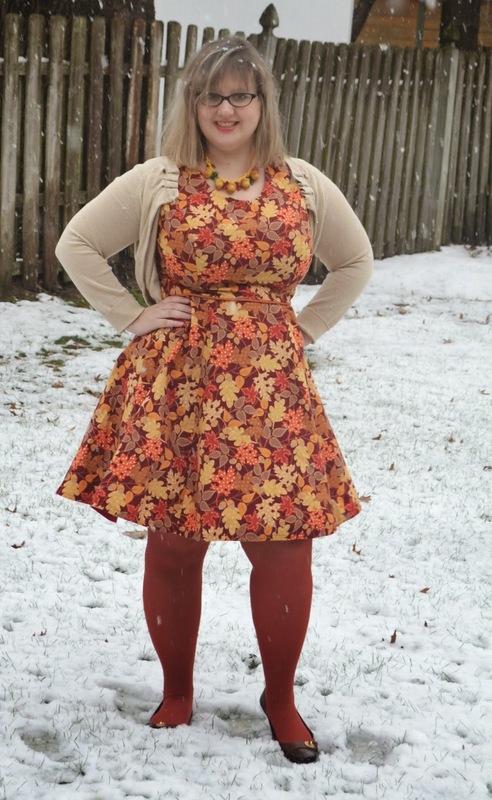 I love it so much, and I don't wear it enough in the Fall so I made a dress to fix that problem. It's my second version of McCall's 6687 view c, it was (see my first one here) so easy to make the first time, I whipped this up in no time. The only change I made to it was to fix the issue with the skirt. I cut the seams down a whole size and now they fit into their proper place. I had to ease inches last time to get the skirt to line up and the side seams. The fabric is a quilt weight cotton from Fabricland, it's a coordinate to a Thanksgiving print I made an apron for display out of. I also used a chinz piping from the home dec department of Fabricland as a belt in the waistline. Sometimes if you can't find the perfect thing you have to think outside of the box! It matches PERFECTLY in the seam btw. I love when that happens, on the first try. 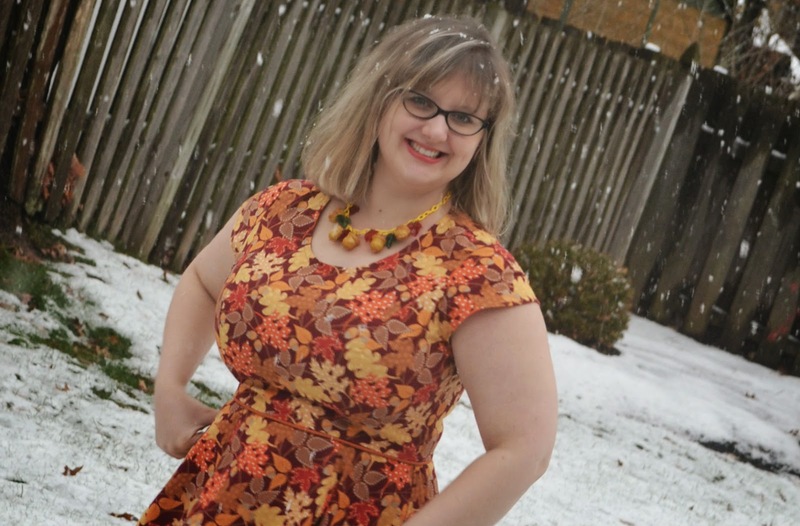 I wore this dress on Thanksgiving and as you can see it started to snow! 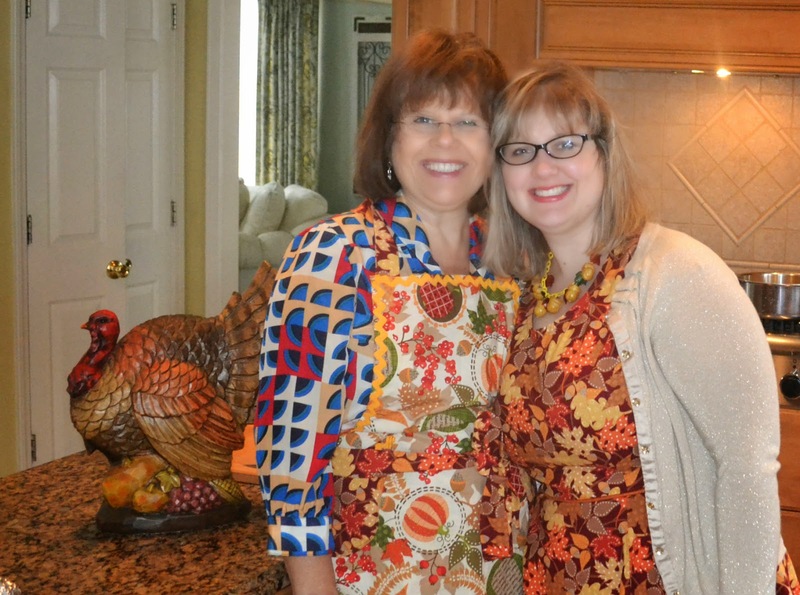 My Mom wore the apron I made her, which coordinates to my dress. I confess I even made a necktie for Rockford the dog to match. Cuz I'm that nerdy whatever. Love the dress--it fits you well. I like the piping also. Love, love, love your new dress! I have this pattern in my stash and now I'll be digging it out again. Yeah, I am so like a big copier! Lovely dress! And you bravely wore it in the snow! The piping is a nice touch. The first one, the spiderweb, was great also! Nice photo of you and Mom! The piping is a lovely touch. Great autumnal dress. Love it! I bought this pattern because of your hallowe'en version - I still have to figure what fabric to use for it. Looks like you have found an excellent tnt pattern. I have discovered your blog by chance and i Love your nice dresses. This one is a Great autumnal work.I love it.